Asymmetry is an idea more often talked about more in video games but the concept works just as nicely when talking about sports. While in football both teams are symmetrical in that both are trying to score in the other goal, in cricket (also baseball, etc) there is the batting team and the fielding team who play different games with different goals and then switch over — these are asymmetric games. The same ‘two games as one’ approach applies to video games with an attacker/defender dynamic like Counter-Strike or the ancient Tafl family of board games which feature a small group of defenders on one side against a larger attacking force. Most symmetrical games have some asymmetrical components — football is briefly uneven in that one team must kick-off — however in turn-based games this can persist and have a noticeable effect. Chess is perfectly symmetrical but White always moves first, giving it a statistical advantage — winning around 53% of games. So which is Curling more like? To briefly sum up the game, matches are split into ‘ends’ where each team take turns to guide stones into the target (or House). The winner of an end is the team that has the closest stone to the center of the target — and the winner gets as many points as they have stones closer than the other team’s closest. This forces ‘two teams trying to do the same thing’ into a attacker/defender dynamic and the whole game into a set of asymmetric ends. The defending team is in the best case trying to steal a point by winning against the hammer, but often is just trying to force the other team to score a maximum of one point — meanwhile the attacking team is trying to leverage their last mover advantage to avoid the trap and score more than one point while they have the chance. So it’s attack/defend, so far so normal, but what is strange about curling is what happens if the team with the hammer fails to press their advantage — they get another go. The hammer only swaps if the team with the hammer score - if they draw or lose, they retain their last-mover advantage. In American Football teams are rewarded for success with more downs, in checkers taking one piece allows (well, forces) you to take other pieces if they’re takeable, and if you win the first stage in Team Fortress 2, you get to try and take the next one. In all those cases if you fail to win the next turn goes to your opponent, promoting fast (and hopefully exciting) game play. 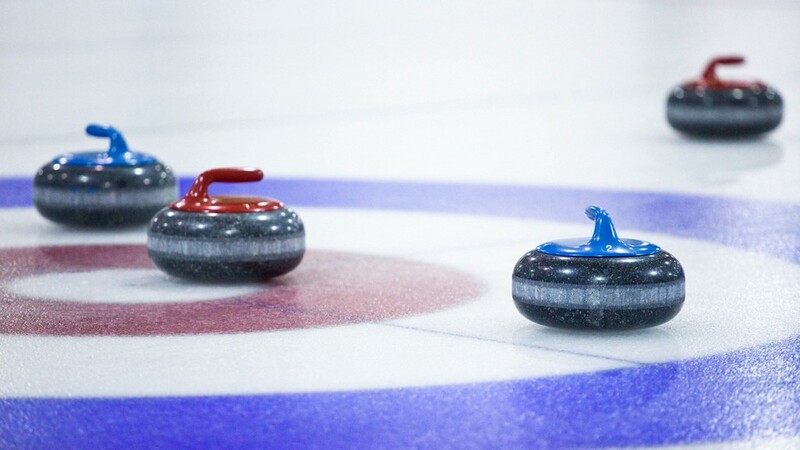 Curling does the complete opposite of that — but with the same goal in mind. 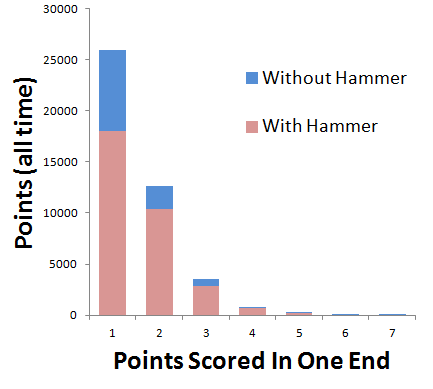 Being able to ‘carry the hammer’ adds an element of strategy — in some situations rather than scoring a one, a team has the option of knocking all stones out of the target which forces a draw and lets the team carry the hammer into the next end (essentially denying the other team one of their hammers). This doesn't mean it’s a bad strategy, this graph just reflects that when you’re in this position you’re already on the back foot. Maybe you can recover but if the other team force it more than once, chances are they’re better than you. This rule seems to exist essentially to keep the game going longer while staying interesting. Matches are frequently ended early when it’s clear one team is unable to recover so in a weird alternate-universe Curling where the hammer passes every end,a higher scoring game will be able to run up a point difference more quickly — making it more likely the game will finish before the tenth end. Letting teams carry the hammer keeps scores lower and allows the weaker team more opportunities to catch up — making an unbalanced match-up competitive for longer. This can have quite a significant effect on the results — in my sample around 24% of games might have had a different winner if the hammer always switched regardless. While Curling’s switching favours the underdog, other games switch to punish failure—but what all these rules are all trying to do is create the opportunity for reversals of fortune. Asymmetrical conflict forever just isn’t any fun at all. Okay it’s also uneven in that different players have different abilities, but it’s not like one team’s strikers are allowed jet-packs and the other team’s aren’t. I would watch that game though. The Canadian Curling Association puts it’s results online http://www.curling.ca/championships/archived-statistics/- but they’re in pdfs so a bit more work is needed to get them into a useful form. I excluded the Canadian Cup (as it acts as a qualifier for other competitions, and so features more uneven teams) and the junior and senior competitions to make the patterns slightly clearer. There’s no real difference in the core patterns if you plot these, but outliers from bad games (which you’d expect in these competitions) make the tails weirder. Also yes, that is a little bit of blue for 7 points , in the 2000 Brier, Prince Edward Island scored 7 points against the hammer. Not great going Nova Scotia. You have to be careful here — you can’t just find the difference between the numbers of times each team had the hammer. When a game is ended early one team has one more hammer but the switching mechanism may never have been in play. 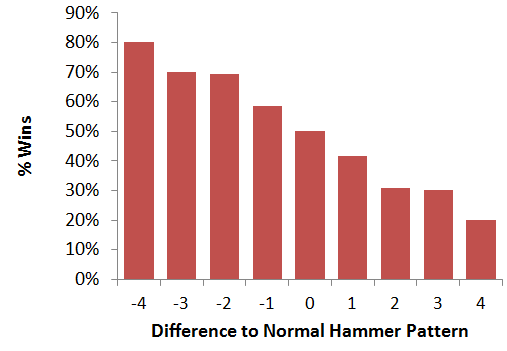 You need to work out the ‘natural’ distribution of hammers given starting hammer and number of ends and then the difference between that and what actually happens. This is further complicated by any round after the 11th resulting from draws by definition so the hammer doesn't move — so you can’t assume an even distribution of hammers in a twelve end games. I took the ‘natural’ hammer progression of a thirteen round game to be ABABABABABAAA. This only came up once, but science is showing method after all. This goes up to 26% for the Junior/Senior competitions. To be accurate what I’m showing here is the percentage of time the statistically weaker team in a fictional even game won the actual game, this is thrown when people are inconveniently behaving differently given different sets of rules — so this is more of a guide to roughly how much of a difference it makes rather than a strict THIS MANY GAMES WILL BE DIFFERENT. To work this the number I constructed an average score for each team where they had the hammer and where they didn’t have the hammer — teamAhammer minus teamBnohammer gives team A a score for their perfectly average set of two ends in that game — the larger score suggests says who was likely to win in a perfectly even game. Where they were perfectly tied I followed the original winner. [FUN EXTRA FOOTNOTE] The Manitoba team in the 2003 Junior Men manage to force draws for all 10 ends and then score one. They are the only team (in my data at least) who manage to win with one point. Trivia answer right there.